Homepage / Blog about Writing Tips from True Professionals / How to Cite a Case Study? A case study doesn’t have its own style. We at our Paper Writing Service know, that the way you cite a case study will depend on the type of essay/paper you are writing, and on the source material. 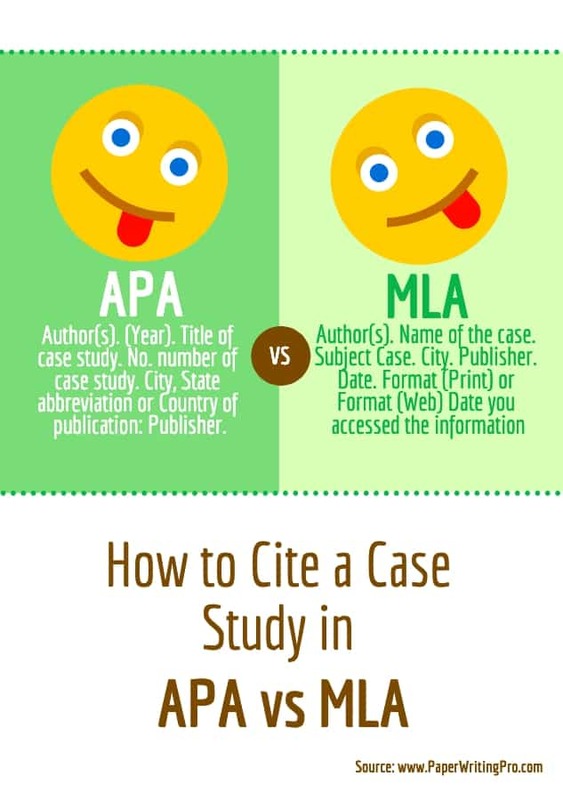 Writing styles such as APA, MLA, etc., have their own rules for citing from different sources. A case study may be in a book, a journal, a website, and so forth. For example, if your case study writing style was Harvard, and the writing material was in a book, then you would have to cite the book using the Harvard style while making sure to note where the case study is within the book. Citing a case study in the APA style is just like citing a quote, paragraph, chapter, etc., in the APA style. Below is an example of how to cite a case study in APA that you can use as a template. Author(s). (Year). Title of case study. No. number of case study. City, State abbreviation or Country of publication: Publisher. Booth, S. (2008). Eating Pickles With Jam. No. 7-806-122. Boston, MA: Penguin Publishing. A case study doesn’t have its own method for citation, you must cite it based on where you find it. If you find it in a book, then cite it like you are citing a passage or chapter from a book. Here is a template that shows you how to cite a case study MLA. As you can see from the website version, you also need to note the date you accessed the information on the web. The publication date is fine, but websites are often updated, which means what you see years later may differ from what it looked like when you accessed the information. Just remember that you are noting the date you accessed the information and not the date it was published. Warning – Students who copy the work of others verbatim are often caught because they leave the “Date Accessed” section the same as the original. The same is true for students who are caught out by saying they completed their project months ago, and yet the “Date Accessed” dates were yesterday. Wolfie, Danny B., and Kimberly Matte. Jam Eaters And Their Nasty Habits. Sociology Case Study. London. Pearl Publishing, 2019. Web. Date Accessed 15 March 2019. Getting your citations correct takes time. It is probably one of the most annoying parts of essay writing. If you are sick of being snowed under with the minutia of how to cite a case study, then get in touch with the PaperWritingPro Service. They have degree-qualified writers who will write to whatever deadline you impose. They write original works that you can hand in as your own, and they do not plagiarize or rewrite. The team is standing by to help remove some of the stress and worry that comes with excessive essay writing. Next When Editing Your Paper, What Should You Focus on?